Mmmmm. 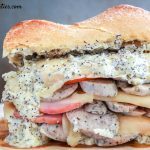 This warm, cheesy stuffed French bread with sausage and Canadian bacon is so good. You'll be hooked from the moment you smell it warming in the oven! Slice the french bread loaf in half lengthwise. Cover a baking sheet with a sheet of aluminum foil long enough to wrap over and around your loaf of bread. Place the French bread on the aluminum foil and gently open without breaking the hinge. Set aside. With a stand mixer on low, cream together the butter, cream cheese, onion, italian seasoning, garlic powder, and poppy seeds. Spread the butter and cream cheese mixture evenly on the inside of both halves of the french bread. Layer the sliced sausage, Canadian bacon and swiss cheese slices on the bottom half of the bread. Fold the top of the bread loaf over the cheese and bacon mixture and wrap tightly with foil. Bake the bread in the foil for 15 minutes, or until warmed through. Unwrap and slice into 2-inch slices. Before baking, wrap the prepared loaf in plastic and foil. Freeze for up to three months. Defrost completely before heating in the oven. Make an Italian twist with sun dried tomato sausage, basil pesto, and mozzarella cheese! Or make it spicy with andouille sausage, cajun seasoning, and cheddar cheese slices. Yum!